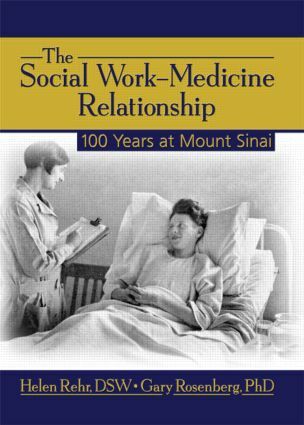 The Social Work-Medicine Relationship: 100 Years at Mount Sinai explores the lessons learned in the formation and management of social work departments in health care, through the perspective of the hospital internationally acclaimed for excellence in clinical care, education, and scientific research. Internationally respected experts Dr. Helen Rehr and Dr. Gary Rosenberg from Mount Sinai use their unique viewpoints to tell the extraordinary story of a century of knowledge and growth, concentrating on the development of the social work department and the people dedicated to providing the finest care possible. This commemoration of the winding path of social work and health care takes the reader on a fascinating and surprising walk through the history of not only a great hospital, but also the effects that the work at Mount Sinai had on the community and public policy. The Social Work-Medicine Relationship provides an absorbing general history of social health care and its growth at the Mount Sinai Medical Center from its inception in 1906 to the present day. This unique review of the factors in place that triggered the formation and subsequent growth of the institution’s social work services department is useful knowledge for every social worker in both academic and practice organizations. Special focus is given to explain how women have consistently been a driving force in the expansion to fulfill the needs of the community. Presentation papers are included from influential women the first half of the century that illustrated patient needs and positively affected the growth of services. The book is extensively referenced and includes several informative appendixes. The Social Work-Medicine Relationship is engrossing reading for social work scholars, historians interested in the history of social work in medicine, directors of departments of social work in health care organizations, and educators and students of social work.